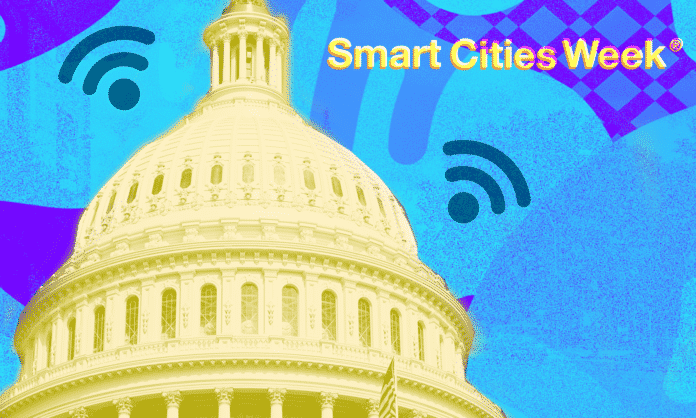 The theme of this year’s Smart Cities Week, which took place from October 2 to October 4th in Washington, D.C., was “collaboration.” The conference gathered 1000 smart city leaders across the public and private sectors to share past learnings and discuss steps to make cities better suited to meet our future needs. This article recaps the highlights and key takeaways of Smart Cities Week. On the first day, a group of attendees gathered to play Ernst and Young’s Future Cities simulation, a case study for the fictional city of “Futopolis,” where participants make decisions that impact quality of life and force them to grapple with the friction and trade-offs associated with any smart city transformation. While no simulation can truly capture the intricacies of the work done by leaders in cities, which have as many stakeholders as there are citizens, the game instilled the necessity for collaboration—a key takeaway from the conference. On the second day, attendees gathered for the opening plenary where Philip Bane, the managing director of Smart Cities Council—a global coalition of industry leaders which organizes the conference—recognized that the industry is shifting from jamming one-size-fits-all technologies down cities’ throats to listening to cities problems and mustering technology to address specific needs. Bane made it clear that all cities are different and that solutions-driven approaches come at a cost to the potential success of any project. This cost was reinforced by the day’s keynote address in which Sameer Sharma, a General Manager for market-specific IOT Solutions at Intel. He shared that by 2025, $341 Billion worth of taxpayer money would be wasted globally if we don’t use interoperable technologies while building out smart cities, a fact from a 2016 Machina research report. Later that day, in a panel entitled “Collaborating for Change: Success and Stories from Smart Cities and States,” Adam Beck, Executive Director of Smart Cities Week, spoke to multiple leaders who reiterated the need for private sector leaders to understand city problems. Frank Johnson, CIO and CDO of Baltimore City, offered a salient reminder. He said that cities already “know how to put sensors on a pole and collect data—it’s the resources to train people” in operating and utilizing these technologies that are missing. Leaders from Baltimore City, only 38 miles away from D.C., popped up again in a separate arena at the conference called the “City Readiness Hub.” The Hub, perhaps the most collaborative of the happenings at Smart Cities Week, paired representatives from “mentor cities” years into the process of developing the future of their cities with representatives from “featured cities” just starting on their transformative journey. One such event included Don Jacobson, a private-sector partner for Innovation in Las Vegas (mentor city) in conversation with Shonte Eldridge, Baltimore City’s (featured city) Deputy COO. By opening their conversations to a public audience, leaders across sectors were able to engage openly in a conversation about both best practices and upcoming challenges. One of the larger themes that emerged throughout the conference was the need for P3s or public-private partnerships. The central importance of P3s emerged in both the panels and the “Exhibition Hall” where technology leaders met with attendees to discuss their products and brainstorm ways to solve existing urban problems. These exhibitors, such as LimeBike—a company that makes dockless e-scooters—and ESRI—which provides GIS (Geographic Information Systems) software that enables geospatial data analysis and a host of other applications, are seen as harbingers for the potential of our urban future. The P3 theme popped up again during the final keynote panel with Miguel Gamiño Jr. and Michael Mattmiller—the original CIOs and CTOs of large cities such as San Francisco, New York, and Seattle—who served as trailblazers in the industry. Somewhat surprisingly, Gamiño Jr. and Mattmiller have both left the public sector to lead Global Cities at MasterCard and Government Affairs at Microsoft respectively. If more people heed the advice of the Smart Cities Week conference and follow in the paths of Miguel Gamiño Jr. and Michael Mattmiller, we will create a constant two-way exchange of talent and experience between the private and public markets. This would certainly be a great first step towards achieving the goal of collaborative and resilient smart cities.